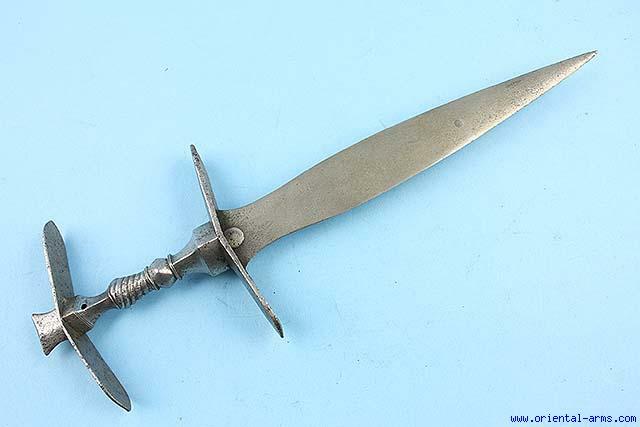 The Jamdhar Katari is a rare form of a dagger in the Indian arsenal. It was popular in North West India in the 16 C. and on. This one is early - mid 17C. Whole steel construction. Blade 9 1/2 inches long, finely forged from Wootz steel with high contrast pattern. Whole steel handle with wide 4 inches pommel and cross guard. Total length 14 inches, very good condition to age. A very rare item.